Regular readers will know just how much I love being part of Secret Recipe Club. It's not just about the fun of revealing the blog you've been secretly perusing all month, it's also checking out what everyone else has made and let me tell you, I've found some absolute gems! 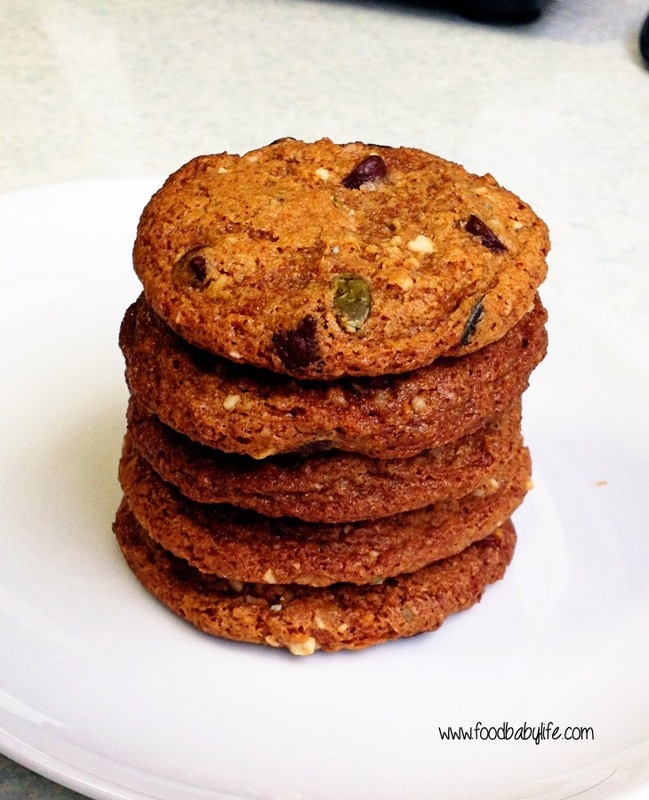 This cookie recipe was revealed last month by Kim at Feed Me Seymour and she tweaked the original recipe found on Life on Food. I love how recipes evolve like this! 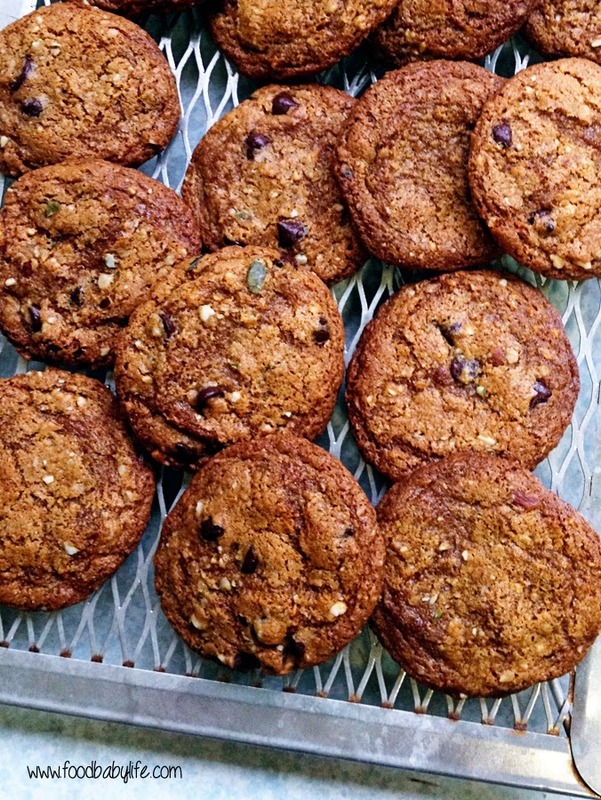 I've been doing lots of baking with coconut oil over the past few months but never cookies. It's also brilliant to fry with and I always add a teaspoonful to Noah's porridge every morning (he needs extra good fats because he is dairy free). I used dark chocolate chips which are naturally dairy free in this recipe, along with a nut and seed mixture rather than the original pistachios simply because that's what I had on hand. You can see a pumpkin seed front and centre in the photo below. It's been really hot here lately which means my coconut oil was completely liquid at room temperature. The recipe said to chill the dough after it was rolled into balls but I decided to chill it before rolling as well. Unfortunately I then forgot to chill them after rolling and stuck them straight in the oven and they spread a lot. No matter, they were absolutely sensational! Sweet, nutty and chewy and really more-ish. It's actually lucky there were any cookies left to photograph because I could not stop eating the dough. Seriously! Preheat the oven to 180 degrees Celsius / 160 degrees fan-forced / 375 degrees F. Line 2 baking sheets with baking paper and set aside. Place the sugars and coconut oil in a large bowl and cream together using an electric mixer. Add the flours and bicarb soda and mix until fully combined and then fold through the nuts and chocolate. Roll the dough into balls and place in the fridge to chill for at least one hour. Once chilled, place the dough onto the prepared trays leaving about 5cm of space between them. Bake for approx 17 minutes or until golden. Allow to cool on the trays for 5 minutes before removing to a cooling rack to cool completely.